Examining a Tab Necklace – Is it Kewa, Santo Domingo or Other? This post is designed to describe the process I go through when I am trying to authenticate whether an item is Native American made or not. Here is a very pretty necklace that may or may not be Native American made. In this particular case, I’m going to say guilty until proven innocent, in other words, not Native American made unless I can find some solid proof that it is. But coming to a verdict is harder than one might think because there are far fewer definitive references for Santo Domingo, Kewa and Pueblo stone necklaces than there are for silver and stone jewelry. Add to that, the fact that very few stone necklaces have hallmarks of any kind. And finally, tab necklaces are much more uncommon than other Native American jewelry. In fact, this is the first of its kind to arrive here. First of all, what it it? It is a Tab Necklace – the three inlaid pendants suspended from the heishi choker put it in the Tab Necklace category. Because it measures 17 inches, I would categorize it as a choker as opposed to a necklace which is typically 24-32 inches long. The very finely turned and graduated heishi is made from brown shell which varies from a deep amber, dark honey to a very dark brown. The heishi is very smooth and expertly produced. Heishi is made by stringing shell or stone, then grinding, sanding and polishing it into smooth edged circles. Each of the heishi discs in this choker are only 1mm thick. The graduation is very well done. This choker is strung on string and finished off with sterling silver cones and a hook and eye fastener. The fastener seems hand made. There is sunburst stamping on the cones. Now to the tabs. The base is made of a very dark wood. It is possibly iron wood or cocobolo wood which some Navajo artists use in conjunction with their inlay work. Cocobolo wood used in conjunction with inlay knife handles by Navajo Doris Yazzie. The inlay on the tabs of my necklace is made with some very interesting turquoise with matrix and a white material that has the hardness of stone. There are no visible pores in the white material and, because of its density, it has been polished to a very smooth surface. It could be ivory, alabaster, stone composite ?? The channels between the turquoise and cream pieces are baffling since they have a distinct gold cast to them. They could be brass, jeweler’s gold or some variation. Each tab has a thinner channel of metal at the bottom position. On the middle tab, that thin channel almost looks like is has leaked something which could be a metal residue or a metallic colored resin or adhesive. As far as age, this necklace was probably made at least 15 years ago and it could be much older. What do authentic Native American Tab Necklaces look like? I’m including information on early tab necklaces for historical interest, not to suggest the choker I am researching is one. Depression era tab necklaces (made beginning in the 1930’s up to the 1960’s) were constructed from various discarded materials such as 78 rpm records, car battery cases, red plastic dinnerware and Dairy Queen spoons. The backing for the inlay on vintage tab necklaces was usually black – from records or car batteries. The heishi used was usually quite thick and made from white clam shell. Most of the examples I have been able to find are necklace length, approximately 26-30″. The ends were finished off with either a squaw wrap or with cones and hook and eye closures. What does all of this mean about MY necklace? I love it. It is beautiful. Who made it? I don’t know. Pros – String, cones and clasp, very fine heishi work, nice turquoise. Cons – Wood backing for the inlay, undetermined material in the channels of the inlay. If you have comments please leave them at the bottom of this post. Be sure to read all of the comments as they come in because that is part of the process of learning about these pieces. Bottom line. 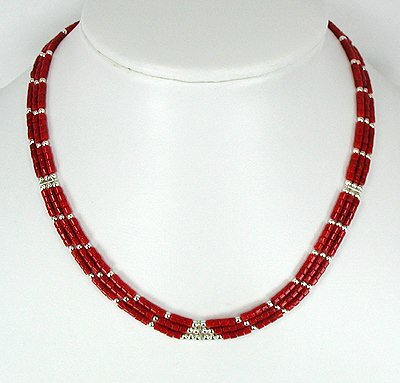 Although this is most probably an imported choker from the 1970’s, it is very well made, pretty and looks great on. So even though not a Native American made necklace, it still is a nice vintage item. It is what it is. Who made this necklace from the 60s and what is it worth? This is a unique necklace as I have not seen anything quite like it. A combination of heishi, claws and a turquoise pendant. When you say you “got” it in the 60’s, how did you get it? From whom and where? That often helps. The heishi looks handmade and like either acoma jet or dark shell (maybe olive shell) with some turquoise mixed in. Its hard to tell from the photos but it looks like there are some (deeply tarnished) silver heishi beads mixed in there too. Are there? 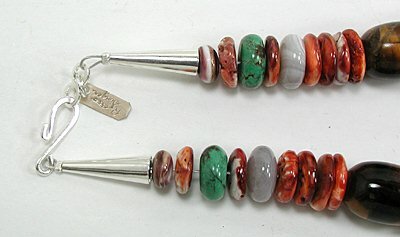 The beads and cones on the ends look appropriate for a Navajo made piece – could be sterling silver with 40 years of tarnish. The claws are meant to represent Bear Claws. Whether they are real or faux claws, I can not tell from a photo. The hot pin prick is really the only way to tell – the smell is quite distinct between a real claw (if you’ve ever smelled burning tooth or bone or even branding of cattle or horses – its something like that) and a faux claw (a more acrid, sharp smoke – think burning plastic). The treatment of the claws is very unique – the two side claws with their silver caps and added into the heishi. Very interesting treatment. But the crowning achievement is the way the three claws are affixed to the bottom edge of the pendant – see best when viewing the back of the pendant. – that took some thought and skill. The setting around the turquoise stone is unusual (i.e. not traditional NA), looks free form handmade. The stone is very blue for being 40+ years old but life in a box might explain that. Does this test positive for sterling silver? In some of the photos it looks like it is, and other not so much. As far as the hallmark, although there are many hallmarks using similar arrows, most have either another symbol or initials along with the arrow. In one hallmark book, there is a drawing of this arrow in the “Unidentified” section. So perhaps someone who reads this blog might have an idea, but I do not. As to what it is, I’d call it a Bear Claw Necklace, whether or not they are real, that is the style. Is it Native American made? It is definitely made in a Native American style but with a very unusual combination of elements. The hallmark leads one to think it was Native American made, but until the hallmark is identified, one can’t be sure if it was Native American made and if so, by whom. As far as its worth, I wouldn’t hazard a guess from photos. If I had it in hand I could give you an idea. When buying heishi necklaces, first you need to know how the artist or seller measures their heishi necklaces. Many heishi makers sell their heishi by length of material used, so 19″ of turquoise heishi might be sold as 19″ …………but with a hook and eye and the bit of slack incorporated in the necklace to make it hang right, the actual necklace wearing length might be closer to 19 3/4″. For chokers especially, each of us has a particular length we like to wear that suits our physique and clothing necklines. That’s when measurement become particularly important. Here at horsekeeping, we measure from the tip of the hook to the eye on the other end. That represents the actual end-to-end wearing length. This results in most thin to medium heishi fitting well……..
but when you are purchasing very thick heishi, necklaces that are 3/8″ thick or more, you should compensate and purchase a necklace that is 1/4″ to 3/4″ longer than your usual length. That’s because the thicker heishi sits away from your neck so some of the end-to-end length is taken up to make the circle around your neck. The same principle applies to Navajo Pearls. If you wear an 18″ 4mm silver bead necklace, when buying a 14 mm necklace, you might need almost a 19″ long if you want it to sit in the same place on your neckline. We provide measurements. The best way to get a good fit is to measure a similar necklace you already have that fits you well and compare it to the measurements indicated for the item. Here’s to beautiful, well-fitting heishi ! There is a term associated with fetish necklaces – stacked. That refers to fetishes strung one right on the top of one another rather than separated by a length of heishi. If heishi is used, it can be pen shell, olive shell, white clam shell, turquoise, jet or other. Here are some examples of the various heishi that is used in between fetishes. Here is an example of a “semi-stacked” fetish necklace, that is, one that has just a small amount of heishi in between each fetish. Here are some examples of true stacked fetish necklaces, those that are fetish on fetish. the type of closure (more on that in tomorrow’s post). I am interested in some of Tommy Singer’s work which is displayed on your website. Items NHS828, NH878, NH827, and the multi-strand bamboo coral. I am wondering what percentage of the beads he uses are actually handmade/handformed by him or his family. My wife and I are building a collection, trying to stick to sole-authorship pieces. Any information you can give me on these pieces, or any others you might have by Tommy and others would be greatly appreciated. The 12K gold filled barrel beads that are decorated, gold, black silver are made by Tommy Singer. Also the solid sterling silver barrel beads are made by him. They are on most of his necklaces. They are his signature treasure necklace beads. The purple and orange spiny oyster and turquoise heishi style disc beads are made by him. Also the other gemstone beads that are disc style. The long narrow bamboo coral – I am not sure but I think not made by him. The little sterling silver decorative spacers – I think not made by him. The sterling silver cone ends are not made by him. So a high percentage of what goes into his necklace is hand made by Tommy Singer or his family. These artists also make ALL of the heishi right on the “string” so to speak. Enjoy browsing and let me know if I can help further. Could you please explain what the Pueblo people eat and how it was cooked and served.Also clothes the women and the men wore. I have always been intrigued with the Native Americans. Thank you for your question. I suggest the library or bookstore to find the answer to your questions about the lifestyle of the ancient Pueblo Indians. To get you started, here is a brief discussion of the use of the word pueblo.